“2-in-1 detachable tablets have become affordable enough that they will compete for consumer spend of both products." There is “immense opportunity” for new and replacement sales of tablets, reversing a four per cent decline in shipments in 2015 to seven per cent growth in 2016, led by a refocused Microsoft and growing demand for 2-in-1 devices. 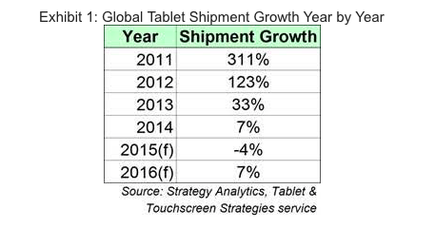 Strategy Analytics’ recent report - Tablets in a Better Shape for Renewed Growth in 2016 - claims tablets and PCs are nearly equally desired among owners of both devices and with over 700 million of these devices beyond the midpoint of their life cycles in 2015. In short, the analyst firm predicts that the “hard work” put in by vendors like Apple, Microsoft, and Samsung to redefine the tablet will bear fruit in 2016. “As replacement cycles have lengthened for both tablets and PCs in recent years, 2-in-1 detachable tablets have become affordable enough that they will compete for consumer spend of both products,” says Peter King, Research Director of Tablet & Touchscreen, Strategy Analytics. “A household could settle on a 2-in-1 tablet for casual use, which can also transform into a dockable mini workstation when needed for more intensive activities. “The existence of the '11-inch or more' tablet screen size category is a great example of the expanding feature set and usage model of the tablet as it plays into the prosumer and enterprise segments due to cost and functionality. As reports swirl about the impending release of the Surface Pro 4, the report claims that Microsoft is leading the growing pack of professional grade tablets running Windows 10. “The release of Windows 10 in July provided opportunities at the high-end to better position tablets against PCs on productivity needs and compatibility with the office setting,” adds Eric Smith, Senior Analyst of Tablet & Touchscreen, Strategy Analytics. Fast growth in the early years means that hundreds of millions of tablets will rapidly need upgrades due to old age in the next one to four years. Furthermore, new tablet sales opportunities outside of the consumer market are being boosted by the work being done and partnerships being forged by vendors such as Apple, Samsung, Microsoft, and HP, focused on the needs of the enterprise.